About a month ago, RightsCorp Inc (OTCMKTS:RIHT) was losing ground at a rapid rate. Green sessions were a rarity, and it looked like the bottom won’t be found any time soon. But how bad was it exactly? Between October 1 and November 18, RIHT‘s market cap shrunk by a whopping 66% and the price dropped from $0.30 per share all the way to just under $0.10. Let’s take a closer look and see what got investors so upset. First, we should probably note that the stock was pumped back in September. The budget was not small, there were plenty of emails, and the hype coming from them managed to support RIHT at some respectable levels. Unfortunately, at one point, the pumpers stopped touting, and it all went South (literally and figuratively). On their own, the financials don’t look too terrifying, especially by Pennyland standards. If you compare them to the results for the second quarter, however, you’ll see that the revenues have dropped by about 1.2% while the net loss has increased by a scary 18%. What’s more, it became apparent back in November that these revenues might be under threat. RIHT‘s methods of monetizing on copyright infringement cases have always been somewhat controversial, and a quick look at various internet forums reveals that plenty of people are not ecstatic about the whole thing. Apparently, some upset internet users decided to act and filed a class action lawsuit against RIHT and its management team alleging them of various wrongdoings. All in all, in light of the facts above, it was hardly surprising that the stock was plummeting to the ground. Yet, RIHT found its bottom on November 18, and we should note that it has been doing rather well ever since. It was taking its time at first, but soon enough, it got going and it started attracting more and more attention. The volumes grew and the ticker really exploded during yesterday’s session when investors traded more than 1.3 million shares. 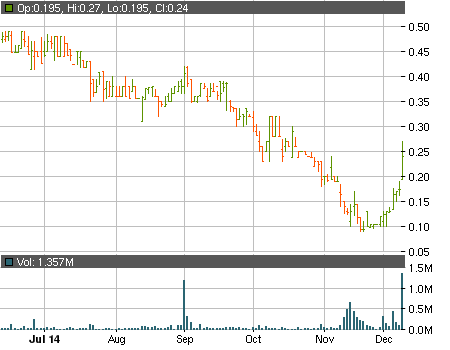 RIHT jumped up by a whopping 37% and finished the day at $0.24 per share on a dollar volume of around $320 thousand. Unfortunately, the run is once again caused by nothing more than a paid promotion. Several third parties splashed out a total of $62 thousand and in exchange, various newsletters like OTCBB Journal, Penny Stock Spy, etc. sent out seven alerts. A few of the emails hit investors’ inboxes after yesterday’s closing bell which suggests that we might see some more action during today’s session. As RIHT has shown many times in the past, however, predicting what’s going to happen is virtually impossible. That’s why, if you decide to swallow the risks and play the pump, proceeding with caution might not be a bad call.